Using the default camera app, or the camera built in to messaging apps, almost always results in a breach of privacy regulations. Doctors often don't get consent, and when they do, they don't record it properly. A whopping 82% of the time, doctors don't document consent when taking a photo. A study among dermatologists revealed that only 2% obtained written consent! While 46% received verbal consent, they failed to document this. See the "Can't I just infer consent? FAQ for details. In a 2016 study, 73% of doctors admitted to storing clinical photos among their private photos, while 26% admitted to accidentally having shown a clinical photograph on their phone to friends or family! That's an instant privacy breach. Even if a doctor "deletes" a photo, on iOS devices it remains in "deleted items" folder for 40 days, and on Android devices it remains in the "trash" folder for 60 days. See the "How do I delete clinical photos I have stored on my photos FAQ. All iOS and Android devices steer you into automatically backing up your photos to their servers by default. If sending a text message from an iPhone to a recipient with an iPhone, it is, by default, sent via iMessage, not SMS. If sent via iMessage, although encrypted, data again leaves the country. See the FAQ Is sending patient data via iMessage safe? for more. You should never have patient data on Apple or Google's servers. There have been security breaches in the past (e.g. the celebrity "hacking" scandal). Privacy regulations forbid sending patient data internationally. The US Patriot Act (2001) potentially enables foreign entities to rifle through patient data, without your knowledge. Many operate under the assumption that they can merely de-identify the photos by not showing the patients face; however, this is not sufficient. Photos taken on the default camera app (or the camera within messaging apps) contain all sorts of metadata that can be used to identify the patient. See "Am I okay to use the default camera app if I de-identify photos?" in the FAQs for more. Fortunately, all new iOS and Android phones have some form of a passcode, or facial recognition turned on by default. Unfortunately, between 11% and 15% of iOS devices, and around 33% of Android devices don't have it turned on. While newer versions of iOS and Android push people into using passcodes, fingerprint scanners or face recognition, sometimes (on some Android devices) these methods are quite easy to "hack". Whether such measures are considered "reasonable" has not been legally tested. With off-the-shelf data recovery tools, one can recover data on "locked" Android devices reasonably easily. Sending clinical photos by email, text message, and even WhatsApp is widespread, but it should not be happening! Email is inherently insecure. Unless you're using a special email encryption service, it's like sending a postcard. Any number of people can view it along the way. See the Is Sending patient data via email safe? FAQ for more. Simply put, text messaging is not secure. iOS sends messages to other iOS devices via iMessage (see above). See the Is Sending patient data via text message (SMS) safe? FAQ for more. Anecdotally, many doctors are using WhatsApp to share patient data. US owned WhatsApp uses end-to-end encryption. Good but not the holy grail of security. Cough, "Snowden". A 2017 a security vulnerability exposed the data of millions of users. It was quickly patched but it's still concerning. By default, received and captured photos appear in the phones gallery. See the Is Sending patient data via WhatsApp safe? FAQ for more. 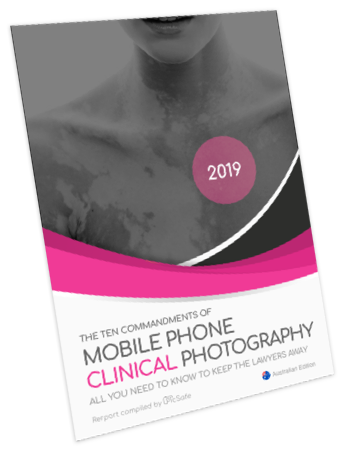 download the free, "The Ten Commandments of Smartphone Clinical Photography" PDF. Why risk litigation over privacy breaches? Sending patient data unencrypted is like sending a postcard. Sending patient data unencrypted is like sending a postcard. Content, as it travels across the Internet, can be easily intercepted leaving you exposed to privacy breach litigation. Cyber-extortion is increasing at a rate of 350% per year with "rich" western doctors being prime targets. As seen on 60 Minutes (America) , there's an unfixable vulnerability in mobile networks meaning it's easy for hackers to intercept text messages from anywhere in the world. All they need is a phone number. 89% of physicians polled admitted to taking clinical photos on their phones, and the practice of then sending them via text message is rife. A hacker can easily intercept messages and threaten to reveal patient data unless they receive an anonymous Bitcoin payment. The doctor is ethically obligated to notify the patient. The doctor is often required to notify relevant government bodies. The doctor may be issued a fine for using insecure practices. The responsible doctor may face suspension, dismissal or other disciplinary action for using insecure practices. The FBI has issued a warning that hackers are actively trying to access patient data to "intimidate, harass and blackmail". By encrypting photos on your device before sending them, PicSafe® helps protect you from this threat. "Obtain patient consent in ALL cases before taking clinical photographs"
Protection of patients' rights to privacy. International Committee of Medical Journal Editors. BMJ 1995;311:1272. Easily add clinical photos into third-party Electronic Medical Record (EMR) and Electronic Health Record (EHR) systems. Send a report to yourself, decrypt and open it at my.picsafe.com, and import it into any third party tool that can accept JPEGs and PDF's. No complex setup required - no need for help from IT! Send reports directly to Fast Healthcare Interoperability Resources (FHIR) supported EMR/EHR's. FHIR is the emerging standard for exchanging health information to and from electronic health records. For more, see "How do I get photos into the medical record?" in the FAQs. Using current standard practices, hospitals and doctors (personally) are likely breaching privacy regulations. Patient care is less efficient, lives can be lost, and there's a risk of litigation for not delivering the standard of care. PicSafe® also uses CBC mode, password stretching with PBKDF2, password salting, random IV, and encrypt-then-hash HMAC. There are no known cases of this encryption having ever been "cracked". PicSafe® has undertaken independent Vulnerability Assessment and Penetration Testing (VAPT). See the PicSafe® Security page for more. There is a paid version with advanced features although the free version will suit most people. Enter Your Email To Download Your “Smartphone Clinical Photography” Guide!